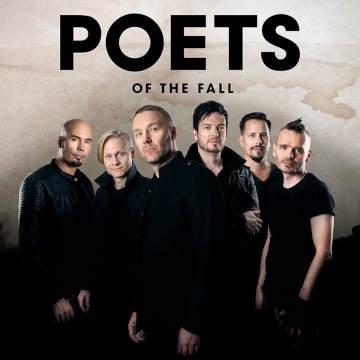 Finnish rockers Poets of the Fall - singer Marko, guitarist Olli and keyboardist Captain - started on their musical adventure from scratch in 2003. The guys built a little studio of their own in Captain's living room for the recording and producing sessions, and kept an office in Olli's beat up old car. The result of the recording sessions was a blend of pop, rock, metal and industrial sounds. Later the guys were joined by guitarist Jaska, bassist Jani and drummer Jari. The band's first single was Late Goodbye, written for the acclaimed computer game Max Payne 2. Reaching millions of people through the game, the song earned the guys international recognition and the first prize at the G.A.N.G. Awards in 2004. Poets of the Fall made Finnish chart history by getting four number one places with their first four albums. In 2018, Poets released their eighth album Ultraviolet , which once again hit the #1 position on the Finnish album chart. Currently the band is recording material for various new projects, as well as playing around the world with the Ultraviolet Tour.